As China is increasingly integrated into the processes of economic, political, social, and cultural globalization, important questions arise about how Chinese people perceive and evaluate such processes. At the same time, international communication scholars have long been interested in how local, national, and transnational media communications shape people’s attitudes and values. 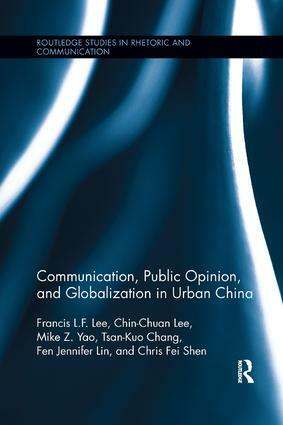 Combining these two concerns, this book examines a range of questions pertinent to public opinion toward globalization in urban China: To what degree are the urban residents in China exposed to the influences from the outside world? How many transnational social connections does a typical urban Chinese citizen have? How often do they consume foreign media? To what extent are they aware of the notion of globalization, and what do they think about it? Do they believe that globalization is beneficial to China, to the city where they live, and to them personally? How do people’s social connections and communication activities shape their views toward globalization and the outside world? This book tackles these and other questions systematically by analyzing a four-city comparative survey of urban Chinese residents, demonstrating the complexities of public opinion in China. Media consumption does relate, though by no means straightforwardly, to people’s attitudes and beliefs, and this book provides much needed information and insights about Chinese public opinion on globalization. It also develops fresh conceptual and empirical insights on issues such as public opinion toward US-China relations, Chinese people’s nationalistic sentiments, and approaches to analyze attitudes toward globalization.